HipChat, a private business chat service that’s similar to Yammer and 37signals’ Campfire, has just launched to the public. You can find our full overview of the service’s private beta here. HipChat looks quite a bit like Campfire, but uses a desktop client based on Adobe AIR, rather than a web-based client (Yammer, which we use extensively for internal communication around the TechCrunch offices, is based on AIR as well). Co-founder Pete Curley says that since launching its private beta, HipChat has had nearly 500 companies sign up who have exchanged over 100,000 messages. He also says that many of the companies to sign up have converted to paying customers. The service is nice looking and easy to get up and running, but it’s still missing a few key features, like mobile applications. Curley says that the HipChat team initially intended to have SMS support and mobile applications developed by the end of the private beta, but that because the product was seeing so much uptake without them, they decided to launch to the public sooner rather than later. 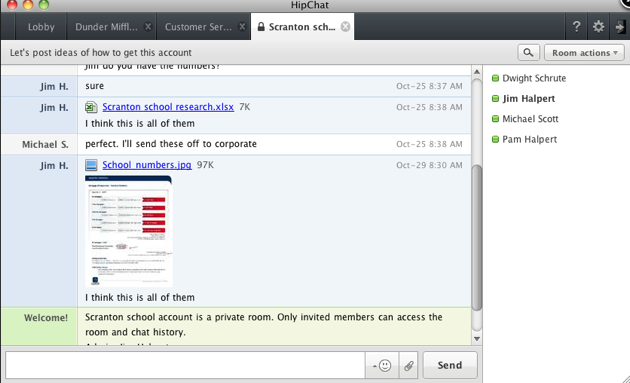 He says that HipChat still plans to launch mobile, SMS, and API features in the very near future. New users can try out the software free 30 days, at which point they have to move up to a paid plan. These range from $9 a month for 12 members up to $99 a month for 100 members.